I've tried to write this post as a review from my perspective and somewhat as an advisory for anyone interested in alternative Manchester. When researching for activities in Manchester there wasn't a comprehensive guide available for the alternatives However, La Carmina did a feature about alt' shopping and food. 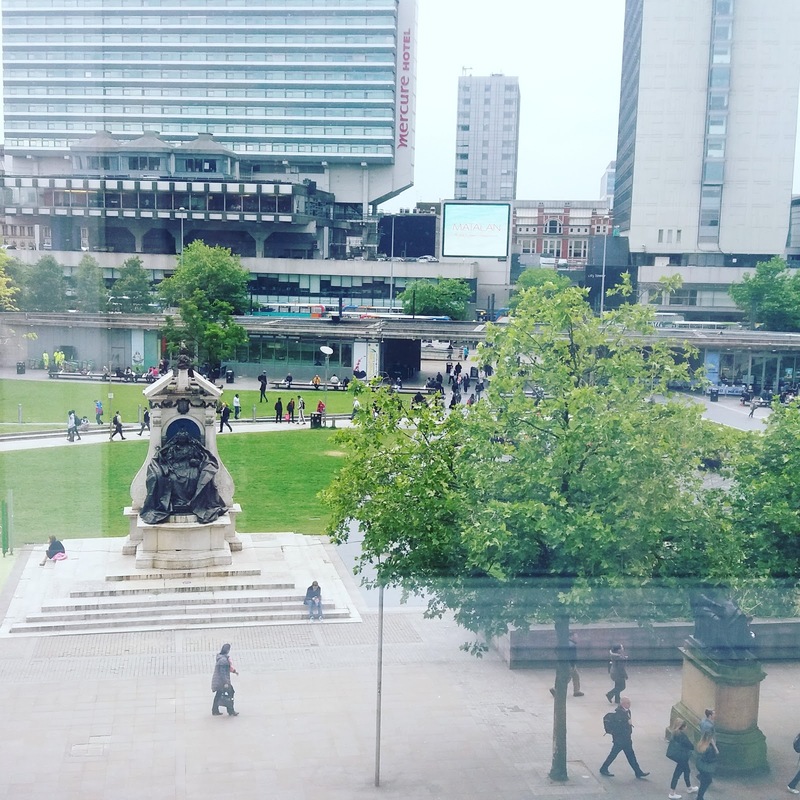 Manchester is a typical Northern city which originally expanded during the industrial revolution of the late 18th and early 19th century building its success on textile production. During the Victorian period, Manchester's textiles were exported globally until it's demise in the late 20th century. The City was regenerated after the city was bombed by the IRA in 90's . Intern, Manchester has a unique array of architecture from medieval, gothic, Victorian and modern. Manchester has an amazing history and close links with creative cultural producing some fantastic music acts including Joy Divison, New Order, The Stone Roses, The Smiths and even the Buzzcocks. The boyfriend booked the Travel Lodge, a basic budget hotel in the prime location in the heart of Piccadilly Gardens. It worked out at £45 per night, not including breakfast. The price was reasonable for the location. The beds are huge and comfy that I could sink into, pure heaven. The windows were effectively soundproofed, which didn't permit any sound to intrude. Additional bonus it was just around the bohemian North quarter. 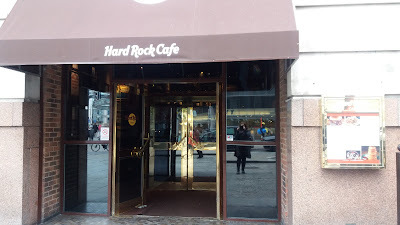 The Hard Rock cafe; it was my first time eating at the restaurant. On first appearances, had atmosphere designed for rockers at heart with array musical paraphernalia displayed on the walls. I found it interesting browsing at various memorabilia on the walls, including Guitars from Scott Ian, Anthrax, Izzy Stradlin, Guns N' Roses and even local legend Liam Gallagher, Oasis. For two of the most interesting items were Elvis Presley's gold sequin jacket and Little Richard's red cape. My criticism is the place felt a little too commercialised and polished to be a rock bar. The menu was an American-style menu with a variety of burgers to order. I love burgers, I felt the burger tasted bland but appeared to reasonable quality and chip looked like real potato chips. On the plus side the portions more than generous. The prices felt over prices but I guess you're paying for the experience, nostalgia and brand. 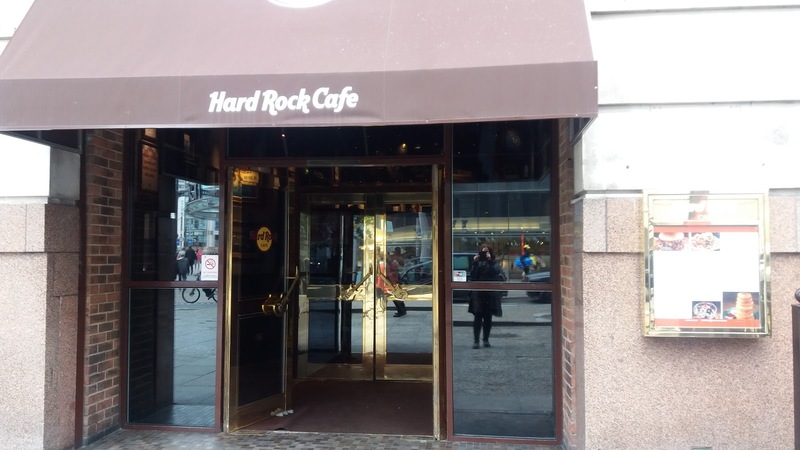 I'm defiantly not a Hard Rock Cafe convert I still prefer my local rock bar burgers. The boyfriend and I went to see Heart playing in Manchester's Apollo. Heart were unbelievable it's hard to imagine the two sisters are in their sixties they still sounded and look so youthful. Heart played a combination of new songs from their new upcoming album and classic songs; they played my favourite Barracuda. When I visit anywhere I like to mix everything up by combining cultural, places of interest and even shopping. When I mean shopping, I like to avoid mainstream shops as I can find most of these in Newcastle. I often enjoy going to interesting, quirky shops, markets and my favourites charity shops. I only visited one charity shop. A few years ago, I found there was a limited selection of shops in city centre everything seemed their price seemed expensive for their stock. I preferred exploring more of the independent and quirky shops of the North quarter of Manchester. The market is for independent artisans, who design and sells their crafts in a former Victorian market. They range from jewellery to textiles, ceramics and art. Below are some of my favourite items showcased. I love the small cat and leather cuff, I regret not buying anything now. I venture to the Arndale Market that had various shops. My favourite was Sparklers is accessory heaven. The layout incorporated two stalls with a vast selection of goodies. The shop sold everything from jewellery, hair accessories and even bags. The vast amount of choice and bargain prices meant I couldn't resist purchasing three sets of hair grips. I was attracted into Oklahoma by the Dia de Muertos style skeletons hanging in the window. I'm so happy I visited; it was a bazaar of kitschy, vintage, quirky, and what the f*&^ items. I wanted to buy the entire shop up, but my meagre budget I left with a black and a gold skeleton cat that made me think of the Cheshire cat from Alice in Wonderland. One of my favourite items were the black and white lamp shades with cats all over it, sadly out of my budget. Affleck's expands over three stories each floor contains a maze of unusual shops hiding around every corner a new shop with something different could be found. For me, this was pure bliss as there are so few decent alternative shops, the nearest to me are in York and Whitby. I'll admit it's great having things like the internet where anything can be ordered at aa whim. I'm a tactile person and prefer being able to touch and try on items. The Bead shop, oh this place had me speechless, it stocked vast amount of crafting materials, ribbons, beads,feathers, and even piping to make cyber personal hair falls the prices were cheap as well, I wish I lived closer to this place it was awesome. Elysia - personally, this was a rare gem. it's a small shop that stocks more romantic goth clothing including my favourite Sinister, which is so hard to find. They stock an array of Dark Star, Queen of Darkness and Spiral direct. For me, Manchester was a feast for my eyes of delights most of older buildings were predominantly gothic revival and with medieval influences. I kept constantly snapping photos to capture every intricate detail of the building. My favourite places to frequent were Manchester City Hall and the John Ryland's Library. Even on my second visits to the building, I'm still awe-inspired. The building was commissioned by Enriqueta Ryland in memory of her husband, she chose Basil Champneys; the building opened to the public in 1900's. The Grade one building has earned the reputation as Europes finest example of Neo-Gothic architecture. Mrs Ryland spared no expense and chose the finest craftsman to build, which still remains evident today. Below is the original, entrance to the library which is no longer in use, and the entrance can be accessed by a modern side entrance that caters for a cafe and a reading room. This is my favourite Libary ever, it feels as though I'm walking through Hogwarts hallways . The library has to be the finest homage to Gothic architecture and the ultimate master folly. When I first encountered the building, I was fooled believing the library was medieval. While walking around, I felt as this was a sanctuary from the busy city, the library fosters the same feelings I get while in churches. I felt a serene, awe looking around the library and relaxed looking at every morsel of detail that's been hand carved. My favourite thing is the library is free and accessible for all members of the public to use rather than turning into a dusty museum. I would be more than happy to spend the entire day sitting in the library. I was a lured by the gift shops Magic, witches, and Devils display table I wanted to purchase everything, I had reign myself in a bought a black tote bag with an image of a rib cage. The town hall feels as your walking through Hogwarts it such a magical place to visit with so many angles and curiosities to photograph. The level of craftsmanship and detail is just breath taking. General visitors are allowed within the foyer other areas are restricted for a variety of reasons, it's still worth a gander and treating yourself to the Sculptural cafe. Unsurprisingly the Town Hall is considered the best example of Gothic Revival architecture in the UK. The hall was designed by Alfred Waterhouse and building was built during 1877. The intention for the building to be either equal or superior to revival other buildings in the country. Waterhouse choose an asymmetrical triangle design for most efficient use of space for the building. In the interior, Waterhouse has used a low vaulted ceiling with intricate tile details all over the foyer.The most dramatic part is the upper levels with the copious amount of gothic detail with dramatic high painted ceilings with twisted stairways and tall columns and cathedral style arch windows. I decided to stop for a quick coffee as the Sculpture cafe has an eloquent and regal cafe. The cafe makes the tastiest and the smoothest latte I've had. I chose a small spot located in the alcove with arch window overlooking the town square. It was relaxing sitting in the chair looking through the windows watching the world go by. I felt a very underdressed for the cafe, I think next time I need to don a fancy a posh frock and order afternoon. The boyfriend and I walked past the town hall during the night, where the town hall was lit up in green. The green lights create iridescent glow adding to the ethereal ambience that just feels magical. I know not another Hogwarts reference but it's all I can think of to describe it. The current church has tumultuous history and experienced much destruction and rebuilding over it seven hundred years history from destruction from the English civil war, German bombings and even most recently from the IRA bombing in 1996. Yet, the church has still remained with the amalgamation of architecture from centuries which still left an interesting building to venture through. The original church site is believed to date from the Saxon period where it was constructed in the early 700's. The current building started in 1421 and the first warden was appointed John Huntington; he oversaw the building of the chancel and the Lady's chapels carved screen. The building continued by the second warden Ralph Langley, who chose the perpendicular gothic style to build the chancel arch and separating the nave and chancel with stairways at the side. Generous wealthy patrons donate money to the church to assist with extending the church through building chapels dedicated to saints. Until the church was confiscated by Henry VIII during the dissolution of the monasteries, he undertook an inventory of the church's goods and closed the church. Under the reign of Mary, I the church reopened , and during the Elizabethan period renamed it to Christ Church. During the 19th century the church underwent extensive building work including replacing the church's original tower and replicating it, and replacing the naives' stone. During the weekend there have been events commemorating the Battle of the Somme. The music echoed all through the church; it was hauntingly beautiful and solemn to listening to the musicians practising. The boyfriend is a big science geek, and he has an affection aerospace since he always wanted to be an astronaut wanted to achieve the through becoming a fighter pilot with the RAF . Sadly, his visual impairment meant he was unable to join, and he opted to study Astrophysics then changed to Mathematics at Uni. The museum originally opened in 1969, later it moved to a former railway station where it opened in 1983 and the Museum has slowly expanded where opened. The museum shows a range of science and industry items being exhibited items are linked to the development of Manchester science and manufacturing industries. Exhibitions extend from aircraft computing, textile industry, locomotive and scientific interactions displays. Below is an experimental aeroplane. Me looking very happy, I've found my dream car. I love old range rovers and really want one. I found the Range Rover Yak, its a jeep with a small kitchenette and enough space to sleep in. I would love to have one to take adventuring. I have a thing for boxy looking jeeps. The boyfriend looking exceptionally happy around the science Museum at aircraft and cars. Friday Night was our last night, we wanted to go out and to have a few drinks. The first stop was a Marble 57, a small Mirco Brewery stocking up on craft beer and ales (I hate these fashionable hipster terms). Anyway, the bar was around the corner from our hotel; the boyfriend seemed happy with selections of beers, and I was happy drinking tea.The bar was quiet and we were quite happy sitting there with our drinks, it had a relaxed and friendly vibe. By the end, our peace was disrupted by a very annoying loud crowd of people, we nearly finished and ready to leave. This was my favourite bar it just reminded me of Trillians. It had comfortable and laid back atmosphere with friendly people. Sometimes, I forget Manchester has a similar cultural to Newcastle and the people are lovely. With a limited selection of drinks, they at least stocked Hobgoblin to please the boyfriend, and I drank lemonade. The drinks were cheap the bar staff and regulars were all so cordial, and we had a carry on with them. The paint colour also offered a point of discussion for me and the boyfriend. The rock music was awesome with constant decent songs being played. I almost felt sad to leave. It felt more upmarket and better decor with interesting Victorian nook and crannies to sit. The beer selection was better for the boyfriend. The place lacked the atmosphere that the Grand Central had. The place livened up once the jukebox started playing, it started putting me in the mood for clubbing. I was really excited about going to this place from the reviews about how amazing it was I thought it would of have been like Legends an old local rock in Newcastle, that sadly no longer exists. I must admit, I was sadly disappointed this place was rubbish and overpriced with bad drinks. The place was incredibly tacky looking reminding me of a haunted house yet, I liked the decor. The place looked like a rock club, the dance floor was also ergonomically laid out being located in the centre of the room and allowing ample space for people to walk around without crossing the dance floors. The two bars are located opposite each other. The drinks were the limited selection and expensive for what they were. The bar only stocked Jack Daniels with Honey rather than Jack Daniels, which it just confusing. However, the barmaid was lovely and did tell me about the JD with Honey. The dance floor was sadly packed with many people drinking and standing on the dance floor. The music was far too emo, I will admit they did play some classics like Korn, White Zombie, Green Day and Marilyn Manson.One thing I highly recommend is they did play Rammstein that wasn't Du Hast, yay. In hindsight, we would have been better off staying at either the Grand Central or the Salisbury. All the shops and lovely architecture! I feel swoons! And I want that dress one of the sisters in the band is wearing! Its very interesting place to visit. Manchester has still retained it's alternative vibe Alflecks was amazing in my home city there is so few alternative shops. Charity and fabric shops fuel my wardrobe. What a really comprehensive guide. I must admit I've never been a tourist in Manchester, for all it's not really that far away!